The Miller Spot: Happy Birthday, Jack!!! I can't believe Jack is 5 years old!! It seems like only yesterday I was holding him for the first time. That being the first time I met him. He was so little then. And now, he's such a big boy!! Here's to a super happy birthday. Jack is one of the coolest kids ever --amazingly smart and always super entertaining. We love him so much!! 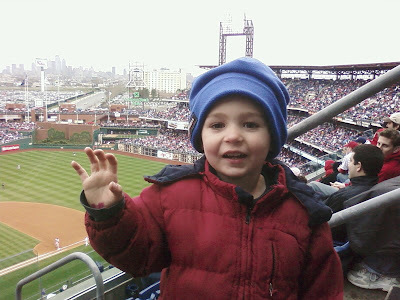 Here's a pic that Jules sent Kevin of Jack at Opening Day in Philly. I'm stealing it because it's the most recent one we have. Who does Riley look like?